Ellis O’Neill, a young drifter withdrawn from the world, is subsisting at the base of the Pyramid of Needs. He wakes up on a lawn in southern Illinois with just enough recollection of the night before to get him to a bus station, Cincinnati, and Danny, his last friend and makeshift brother, waiting with a sedan pointed two thousand, two hundred miles west. Officially, they’re checking on Danny’s sister, Angie, missing in action for months, her whereabouts finally verified by a vague letter postmarked California. The two have cause to be worried about her safety sans chaperone, but the knights-in-armor motive is a front. For Danny, the trip is an excuse to get his friend back, to pull Ellis back into the world. Ellis isn’t sure about the world, but he’s sure about Angie, his only proven solution to a life shaped by alienation and neglect. This is one of those books where I read the blurb, and had a feeling it’d be the book for me. Not too long after starting to read Bleeding Gut Blues I didn’t just feel that it’d be the book for me, I KNEW it was the book for me. I was instantly sucked into the story and barely realized that I had flipped fifty pages so quickly. I instantly related to the main character, Ellis. This was almost to the point where I felt like I was him. I felt like I had much in common personality-wise and how that affects various aspects of life. Ellis wasn’t the only great character, they all were. Danny, Angie, Kate, and even minor characters that show up for a brief period of time, they were very well written. I wouldn’t have been surprised if this novel was actually a work of non-fiction. That’s how believable it was to me. I’m a sucker for a good road trip book. This type of story is great for a character to grow through the obstacles that arise, the people that they meet, and the self-discovery of being on the road. The main character, Ellis, isn’t the only one who develops as a person. I feel like this made the book stronger and stood out more to me. The entire group changed for the better, even if it was just taking a step back and seeing what should be fixed…even if the reader doesn’t know how much they put what they learned into action. They are still young, so who knows what’ll happen in a few months. I liked that too. Sometimes a book makes the ending seem too final. The growth of a character too perfect and lasting. Almost like there’s no room to stay a flawed character. As I said, the story and the characters were so believable; a great strength Fitts shows. The dialogue and physical interactions between characters seemed spot on for who they were. Nothing was forced. When S Fitts comes out with another book (I hope that happens) I will be very happy to get my hands on it. I can’t say anything bad about this book. I’d like to, but i can’t find anything to point out. 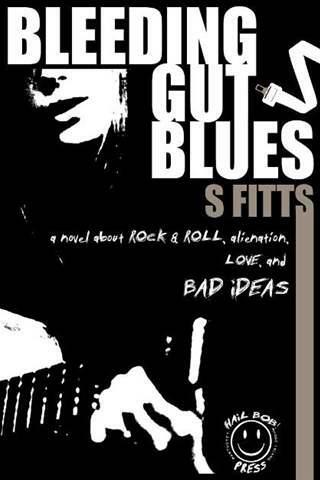 Born in Houston, transplanted in Rhode Island since 2000, S Fitts is the author of Bleeding Gut Blues and keyboard player for punk bands Almost Blind and Drunk Robb & the Shots. You can purchase the book through Amazon or the Bleeding Gut Blues site. This entry was posted in Review, Uncategorized and tagged Bleeding Gut Blues, Drugs, Friendship, Growing Up, Homeless, Love, Music, Review, Road Trip, Runaway, S. Fitts. Bookmark the permalink. This actually reminds me a lot of Brett Easton Ellis’ work, or maybe a modern-day Kerouac. I’m excited to check it out! Great review, as always. I haven’t read Ellis’ work (I think I’ve talked about him with you) but I’d read a bit of Kerouac, and everyone knows the story of On The Road even without reading. I think that’s a good comparison. Maybe not in the writing style, since I haven’t read enough of Kerouac’s book to make a judgment. But in the journey/growth aspects. I think it’s safe to say that.